Jean outfits are always on trend. You can dress it up or dress it down. Jeans are crucial to any wardrobe. Every girl should have more than one pair of them in their closet. One pair of jeans can equal 10 different looks. Paired with the right items, your jeans can take you from classy, to edgy, to sporty, to classic and a whole lot more. Look good for every occasion, all year round, with these 29 trendy jean outfits. Get inspired and even create your own. Play your guitar, ride a bike, or read a book, but do it in style with this cute simple outfit. Enjoy a relaxing day doing the things you love. Or just do nothing at all. Be ready for anything, anytime, anywhere. This unique crop top and ripped jeans bring excitement and spontaneity. Take some risks in this on the go outfit. There are adventures to be had and moments to be made. 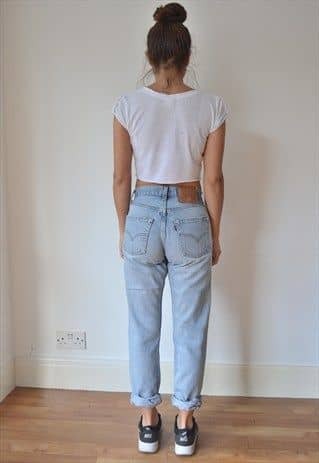 Look vintage, in these high waisted jeans and plain white t-shirt. This style is so timeless and classic. Sit on the hood of a car at the drive-in theater and be the girl guys want, but can’t seem to get. 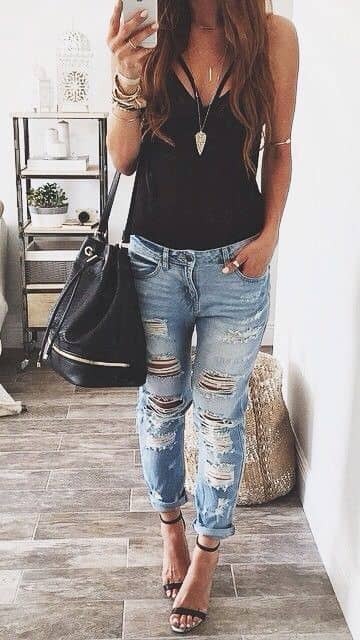 This black ripped jeans and ripped top outfit totally looks like you are ready for a wild night. Maybe you are going to see your favorite rock star or maybe you are a rock star… Who knows. Have your own style. Show off who you are with this hip outfit. All of these pieces stand by themselves but also work together to create one amazing unique look. Did you always want to be the popular girl? Well, here’s your chance! 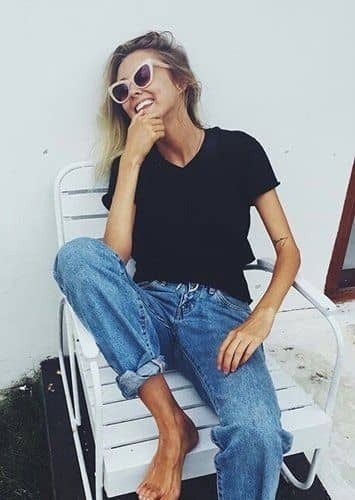 These ripped jeans make you trendy and cool while the simple top says, “Im laid back”. The necklace brings it all together to add unique style. Look too cool in this dope outfit. 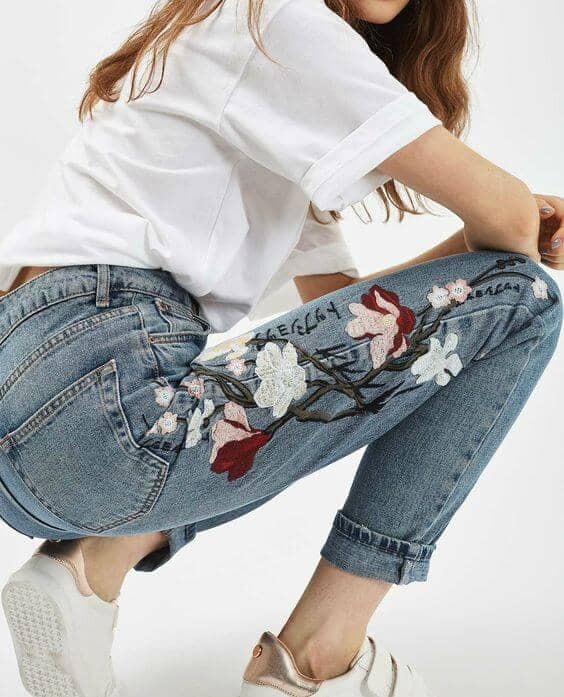 Pair these jeans with a graphic or print tee and let it speak for itself. Add some simple and clean white vans and a crossbody purse for some flare. Put the haters to rest and look amazing head to toe. Go all out for this look and kill the game in all black with black accessories to match. Guys will wonder if they can even handle you. 10) ARE YOU A BUSY WOMAN? 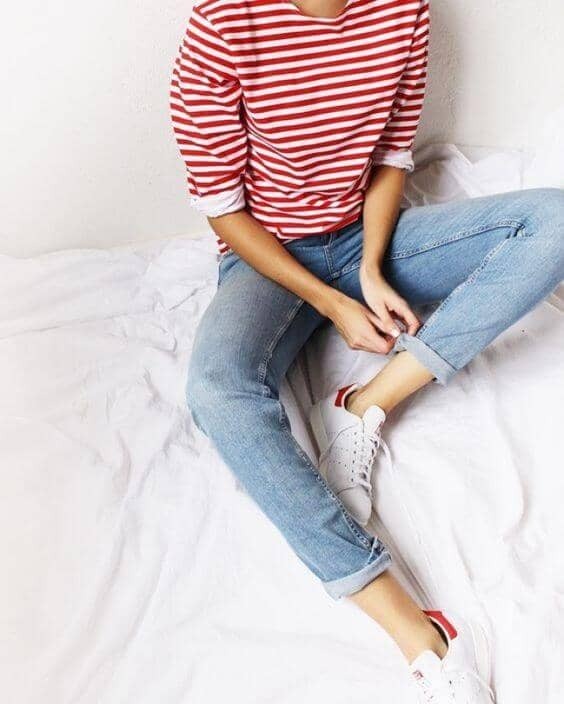 Do you want to do things around the house and look cute doing it? This is the outfit for you. Throw on this loose-fitted t-shirt and dark jeans and finally cook that brownie in a mug recipe you saw on Pinterest. Feel free and flowy this summer. Add some pop to your jean shorts and get in the spirit of spring with this bright colorful knit top. Get out the house quick and run some errands in style. 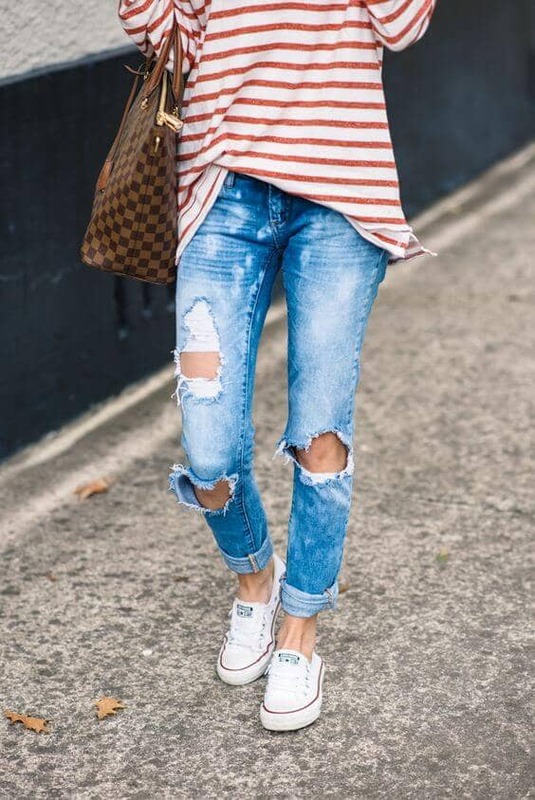 Pair these ripped jeans and vans with almost any top and go. Everyone will be jealous of your effortless style. Take a long walk on the beach, catch some waves, then slide into these jean shorts paired with this free and comfy sweater. Grab your favorite drink, kick back with friends and stare off into the sunset. Push the boundaries and get super fly in this gray themed jean outfit. Give total Bad girl vibes by pairing it with some nice shades and heels. Let people know you really don’t care. *Hair flip. This classic black t-shirt and jeans look can turn super hip in a matter of seconds. The flannel scarf tied at the waist gives this look a cool factor. You could even put it on and change up your whole look. Endless possibilities! Want to look classy in jeans? Pair your jeans with a somewhat flashy shirt, a fashionable bag, and some strappy high heels. Don’t forget to add a ton of jewelry to give the appearance of being dipped in gold. Let your hair down with this one and live on the wild side for a while. From the bralette to the distressed jean shorts, this outfit says you’re the girl that can’t be tamed. Accessorize your jeans with this super girly jeans outfit. This style is great for girls that like to feel all done up. Put on some heels, bring out your favorite jewelry and primp, primp, primp! Stand out in the crowd with this stylish look. This hat paired with this outfit will be sure to spark up a conversation. You’ll look classy and cool. 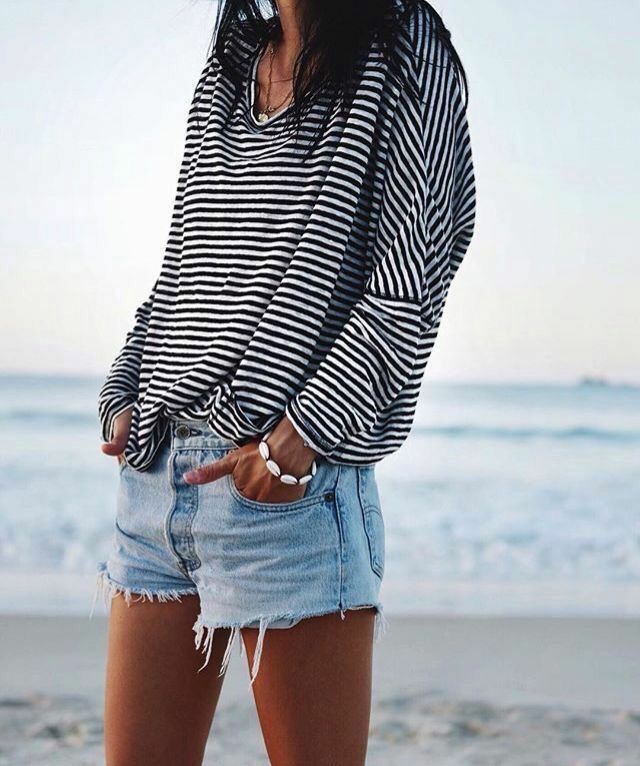 Feel overwhelmingly cool in this oversized sweater paired with these jean shorts. Be comfy and cozy. Add some statement jewelry pieces and look relaxed and fashionable at the same time. The best of both worlds. Look like you just stepped out of a magazine with this every day fresh model look. Strut down the streets to your hair appointment like you are on that runway girl. Get down and dirty in this sporty tomboy jeans outfit. Whip out the skateboard, do a backflip. Just show those boys that anything they can do, you can do better. 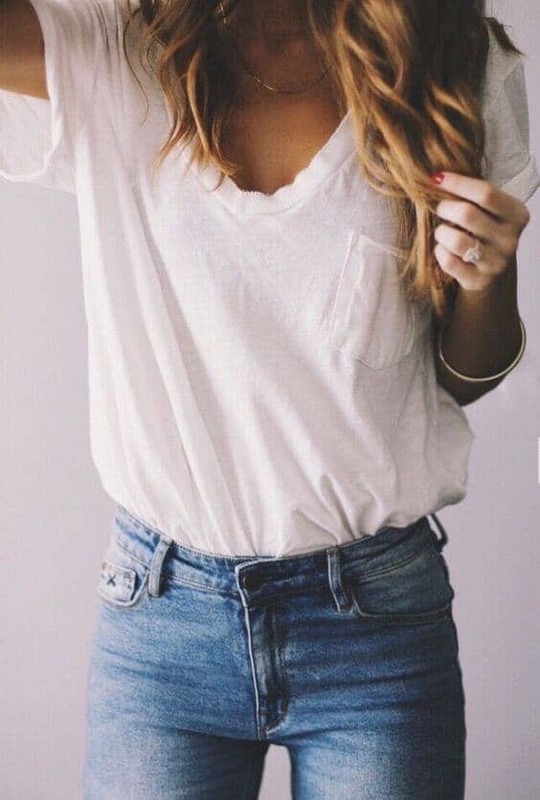 Take down the system in these totally awesome loose Jeans and plain white t-shirt. You will look like a classic rebel in this outfit. Don’t stir up too much trouble. Sugar spice and everything nice. 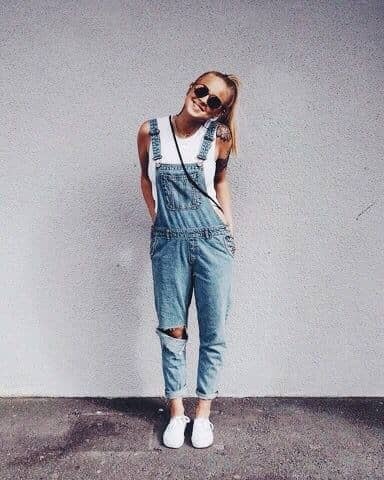 These dungaree jeans can be edgy and cute at the same time. A nice cross bag, some simple vans, and timeless shades are the ingredients to create your perfect summer outfit. This outfit is ultimate chill. Youll be ready to take on anything in this casual outfit. Hang out with friends, play video games or go to a little get-together. Steal some glances with this back cutout and fitted dark jeans. Look all done up during the day then whip that hair down and transition right into the night life. This outfit will have you turning heads. When you walk into the room, guys will say, “Whos that girl?” It’s perfect for a date. When you’re trying on a hundred outfits, thinking, “Am I trying too hard?”, try this simple yet elegant style. Look Instagram ready with this stylish outfit. Let every piece shine on its own. You don’t even have to go outside. Just take some pictures and go back to sleep. personalize your jeans. This outfit tells people you are different and you do what you want. Wherever you go, people will know that you make your own rules.